Crowds marched through Liverpool city centre on 20th July for the annual James Larkin march which was relatively peaceful this year. The event in 2012 to commemorate James Larkin, the Liverpool-born trade unionist, was marked by ugly scenes which led to 26 arrests. This year’s event included a heavy police presence of 250 officers, including liasion support from colleagues from the Police Service of Northern Ireland (PSNI), who escorted the marchers from their meeting point at James Larkin’s birthplace in Dingle to the Pier Head, where speeches were made. 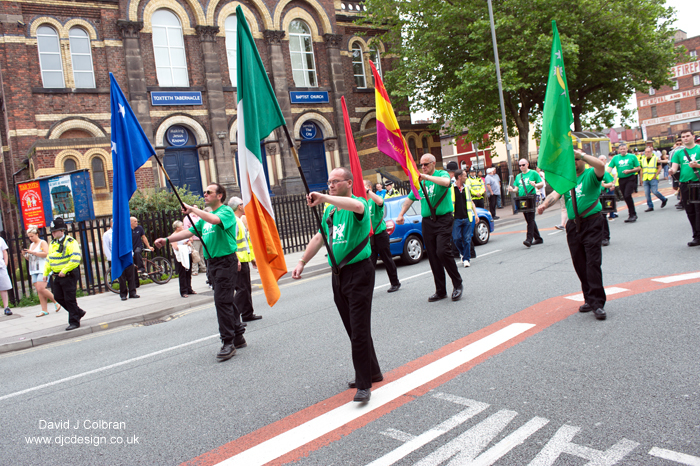 Around 250 people attended the march, which was led by the Liverpool Irish Patriots Republican Flute Band and included representatives from many trade unions, including Unite and the PCS. Police moved swiftly to deal with a minority of people lining the route who shouted abuse. Police reported a very small number of protesters and that there was 12 arrests for various offences including possession of a controlled drug, breach of the peace, and racially aggravated public order. 2012 saw 26 arrests being made as the event was targeted by far-right groups including the National Front and the North West Infidels, who branded the event as an 'IRA march' in order to stir up community tensions. Please contact me for usage licencing details.